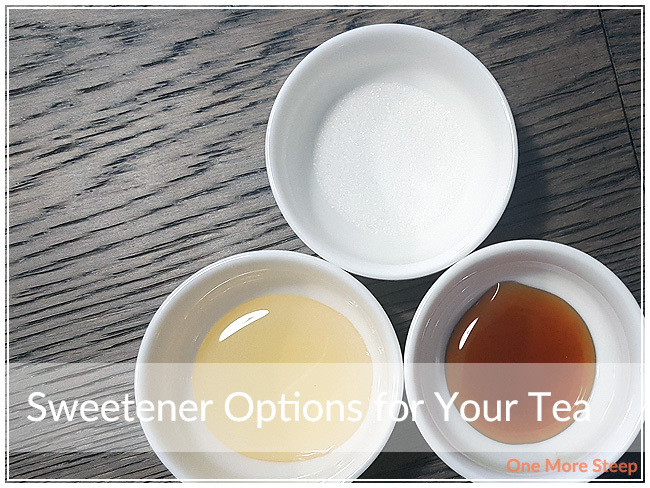 There are a lot of different sweetener options out there if you want to add a little something to your tea. But is any of it good for you? A lot of nutrition experts out there refer to refined sugars as being empty calories because it contains calories but no nutritional benefits, which is not what you want. I’m sure most people on the internet these days are no stranger to the phrase obesity epidemic where a lot of people (especially children!) are consuming more calories than they’re expending. It’s the sad reality in relation to eating highly processed foods and foods that contain a lot of sugars/carbohydrates. However, I believe in eating in moderation, and that includes having sweetener in my tea (especially for drinks like a London Fog – yum!). For those using imperial measurements, 10g = 10mL = 2 teaspoons. Honey, an animal product produced by honey bees, is a tasty sweetening option. Pure raw honey contains sodium, potassium, iron and more vitamins and minerals – depending on where the honey is harvested from. If you suffer from seasonal allergies, getting locally harvested honey or bee pollen can be a great way to lessen the severity of your seasonal allergies – have a chat with your primary health care provider or allergist! Per 10g of honey, it contains 8.2g of sugar and 30 calories. Refined white sugar is an easy store staple to get a hold of. It’s probably the first thing most people think of when they think of sugar and it quite literally contains nothing else besides sugar. White sugar is produced either from sugar beets or sugarcane. Per 10g of refined white sugar, it contains 10g of sugar and 39 calories. 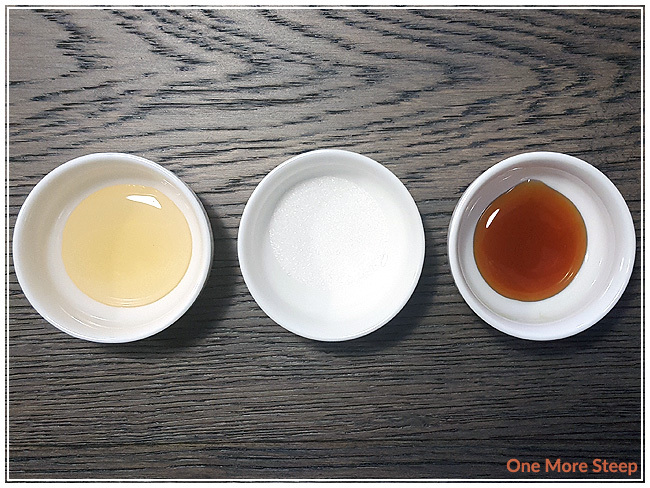 From left to right: agave syrup, refined white sugar, wildflower honey (local). Brown sugar, on the other hand, is a mix of sugar with molasses. Because of the addition of molasses, you’re actually getting some extra nutrients with the sweetness. Brown sugar contains sodium, potassium, iron, and magnesium. Per 10g of brown sugar, it contains 9.8g of sugar and 38 calories. Agave syrup (or agave nectar) is a sweetener produced from the agave plant – which is also where tequila comes from (fun fact?). It has been marketed heavily as a “healthy and natural” alternative compared to white sugar, despite being a heavily processed sweetener product. Agave syrup is often described as being ~1.5 times sweeter than white sugar, so you need less of it to get the same level of sweetness. However, agave syrup is on par with high fructose corn syrup in terms of healthiness – it may be “better” for diabetics as it has a lower glycemic index (no huge spikes in blood sugar after consuming the product), but it has a high level of fructose, which has been heavily linked to obesity, type-2 diabetes, high triglycerides. Per 10g of agave syrup, it contains 6.8g of sugar and 31 calories. Rock sugar is another sweetener that often gets some fame for being “healthier” than refined sugar. Rock sugar can be either refined or unrefined sugar that’s been crystallized into irregular shapes. It can be made with either cane sugar or sugar beets. Per 10mL of rock sugar, it contains 10g of sugar and 40 calories. Whatever option you choose, it’ll add some sweetness to your tea. Sweeteners can help brighten up the flavour of your tea, especially if it’s a tea blend. I find that it helps make some ingredients stand out a bit more or helps to temper other ingredients, like the tartness from hibiscus. What’s your favourite sweetener that you like to use?